Day 6 is here! Well, we’ve had some nice little games shown so far, but now it’s time to show off some big stars. And it’s a level from a game I had a ton of fun playing not too long ago! Today’s Obligatory Ice Level is Snowball Park, from Super Mario 3D World! Super Mario 3D World. Do I really have to introduce this game? Probably not, but I’m going to anyway! This is essentially a multiplayer equivalent of Super Mario 3D Land. The stages are large obstacle courses full of dangerous traps, treacherous terrain, and lots of enemies. But on the plus side, you do get some neat power-ups, most notably the Super Bell, which gives you all the powers of a cartoon cat. Plus the music is really good! 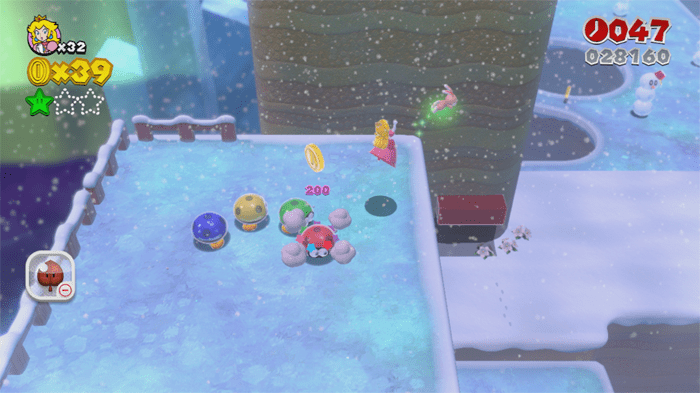 Snowball Park is the first stage in World 3, which has a general snow theme. This stage is known for being full of SNOW POKEYS. What’s a Snow Pokey? Well, it’s like that classic cactus enemy, the Pokey, only made of snow! And just like a snowman, naturally it wears a fez on its head. Call it a “bucket” all you want, but it’s so totally a fez. There’s also a lot of slippery ice, which can be quite a problem when there are four players who are constantly running into each other anyway. But you know what else this level has? Goombas in ice skates! Seriously! They’re just riding around in giant ice skates! It’s awesome! And what’s more, you can defeat the Goombas and steal the skate for yourself! The skate’s kind of hard to control, but it’s really fun and pretty hilarious looking. Music? You want music? Well I’m pretty sure I got you covered there! Freezeflame Galaxy‘s icy theme from Super Mario Galaxy is nice and serene. Likewise, Freezy Flake Galaxy from Super Mario Galaxy 2 is a sweet little tune! The Snow Overworld theme from New Super Mario Bros. U is really catchy, so much so that event he baby Yoshis sing along to it! And of course we can’t forget Snowball Park‘s theme! 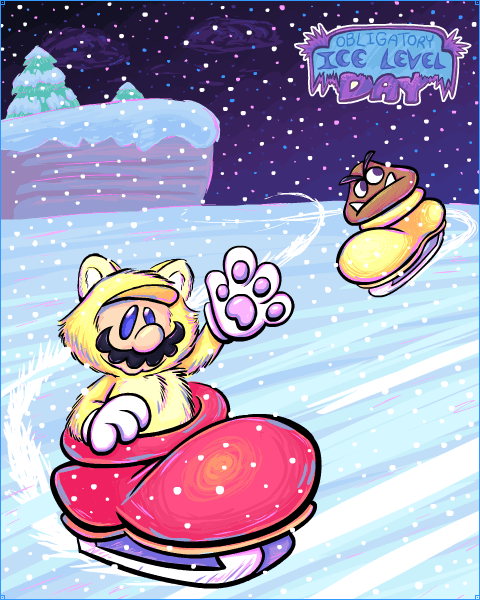 And on top of that, here’s Frappe Snowland from Mario Kart 64! And for a remix, I really like this guitar rendition of Frappe Snowland, by CSGuitar89! It’s a simple, but wonderful take on this classic tune. So what will tomorrow’s ice level be? Will it be from a famous game, a forgotten gem, or an obscure new title that needs more love? Guess you have to just wait and see!